Cleveland is blessed with countless parks and landscaped gardens. 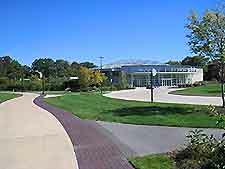 Owing to Cleveland's favorable location on the banks of Lake Erie, many parks and gardens offer outdoor recreational activities, making a welcome break from city living. Swimming, fishing, boating and biking are all common activities in Cleveland thanks to its parks. Seasonally, ice fishing and sledding are also possible in Cleveland. As well as its public parks, Cleveland is home to beautiful botanical gardens featuring award-winning displays and a magnificent cemetery set in impressive grounds. Cleveland Botanical Gardens has 10 acres / 4 hectares of award-winning display gardens that attract visitors throughout the year. Also popular at Cleveland's botanic gardens are the greenhouses, which contain distinct ecosystems, making the gardens a fascinating family attraction. In the heart of the city, Cleveland Lakefront State Park provides natural relief from urban living. Leafy picnic areas and sandy beaches are found within the park along the Lake Erie shoreline. 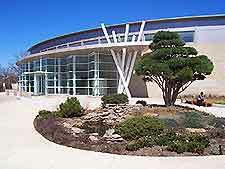 The park boasts a large pavilion, swimming and fishing areas. 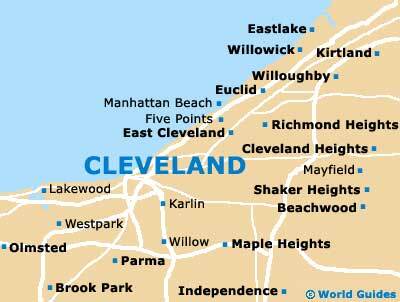 Cleveland's Euclid Park boasts a 650-foot / 200-meter swimming beach, shaded picnic areas and an observation pier. Gordon Park offers six boat launch ramps, a park office, picnic area and fishing platforms. Set in 285 acres / 115 hectares, this magnificent cemetery is home to many rare and beautiful flowers and plants. Visitors to Cleveland's Lake View Cemetery will find a collection of Japanese thread-leaf maples and gingko trees, while in the spring the main attraction is the impressive blossoming of Daffodil Hill, boasting over 100,000 bulbs. 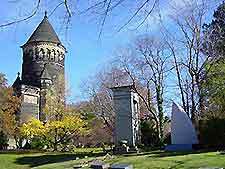 The cemetery is also of great historical interest in Cleveland, with many famous interred residents including James Abram Garfield, the 20th president of the United States, and also John Davison Rockefeller.